I had Mike N Willie’s the other day for lunch at Hudson Square. I heard rave reviews about the place beforehand from a co-worker, so I decided to go see what all the commotion was about. I was not disappointed. 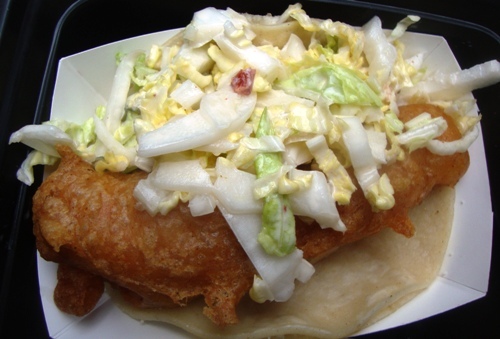 I got the beer-battered fish taco, which was cod (very fish and chip-esque) and it was everything I hoped for it to be and just a bit more. The fish was soft, not too oily, and bursted with flavor. It wasn’t too salty at all either, like cod can be. However, the only problem was that it took forever to wait in line, and even more time to receive my food. I thought, there has got to be a better way then this! Waiting about 30 minutes just to order was not ideal for me, and really cut down on the time I had to eat lunch. Waiting an additional 5-10 minutes also wasn’t really convenient either. While I was in line, I was approached from some people giving out flyers about a website called http://bit.ly/FoodtoEat, which allows you to order from food carts online. Finally, an answer to my prayers! I was told that you can place your order online and pick it up when you get there, allowing you to skip the line! This is definitely a huge lifesaver and would help me have a longer, more relaxed lunch break. I saw this video that explains more about what FoodtoEat does on YouTube, http://bit.ly/FoodtoEatY…. It was very well done and I love the concept, and how it can save me so much time!